LAS VEGAS — Some day, the streak will end. For now, Team North America is simply taking it all in and enjoying the ride. The home team stretched its victory streak to five straight years on Sunday night at the Orleans Arena in Las Vegas, capturing the 2017 World Financial Group Continental Cup, presented by Boyd Gaming. And another packed house at the Orleans went home thrilled with the circumstances of the victory: a simply dazzling steep-angle double takeout by Winnipeg’s Reid Carruthers sealed the deal in the fourth end of his game against Team World’s Niklas Edin of Sweden, setting off a wild on-ice celebration with his North American teammates. The final margin for North America was 37-23, and leaving Team World in the runner-up position yet again — a role it’s had to endure since its last triumph, in 2012 at Langley, B.C. 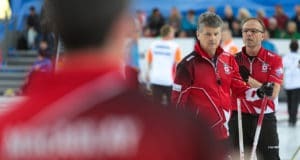 Unlike the dramatics of the 2016 WFG Continental Cup, that went down to the last few shots before North America pulled out a one-point victory, this year’s event was all but decided on Saturday night. Team World had started the event in impressive fashion on Thursday morning, taking 2.5 of the available three points in traditional team competition. But the Team North America juggernaut took over, winning the majority of the points in eight of the next nine rounds, while the other round was split evenly, leading into Sunday night’s impressive clinching performance. 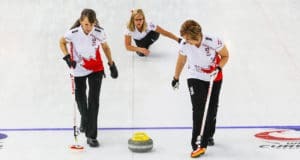 In the other skins game, North America’s Kevin Koe of Calgary and his mixed skins team (third Alex Carlson, second Brent Laing and lead Vicky Persinger) was a 4.5-0.5 winner over Thomas Ulsrud’s mixed Team World foursome (third Binia Feltscher, second Christoffer Svae, lead Franziska Kaufmann). 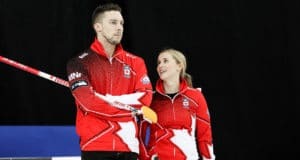 Team North America won $52,000 Cdn ($2,000 per member, including captain and coach), while the World team earned $26,000 ($1,000 per member, including captain and coach). As well, Team North America won a $13,000 bonus ($500 per player, plus captain and coach) for taking the most points out of the six skins games. Final attendance for the four days was 52,753 — the second highest total in event history, behind only last year’s record total of 62,498. A host location and dates for the 2018 World Financial Group Continental Cup will be announced in the next few weeks. Curling Canada’s Season of Champions continues with the 2017 Canadian Junior Men’s and Women’s Championships, presented by Ambrosia Apples, beginning next Saturday in Victoria.